Besides using BluePath for finding accessible places, this article gives you tips for taking your first big trip as a wheelchair user. 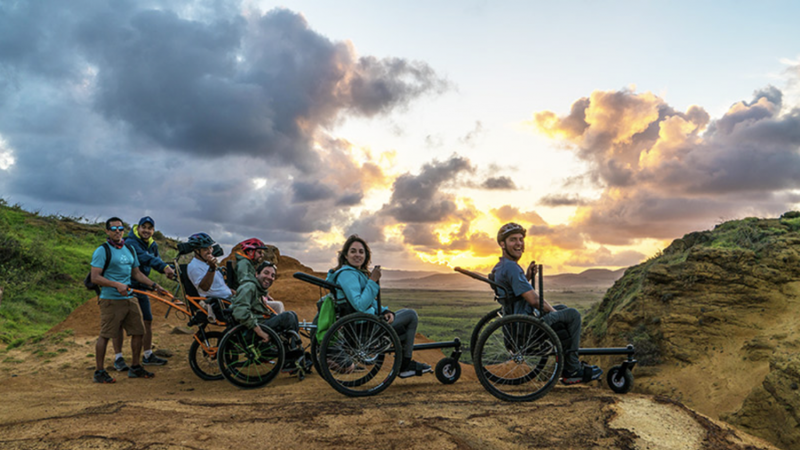 We want you to know that fun, safe, even adventurous wheelchair travel is possible and that exploring the world without limits is a realistic possibility for you!We have the expertise – after all, our team explored Machu Picchu in a wheelchair! – to suggest a few things that can make your trip easier. Let’s go! How wide are the doors? Are there steps, elevators, is the room on the first floor? Do you have roll in showers? That way you’ll get a better, more realistic picture of what your money is buying. We’ve had great experiences finding wheelchair-friendly accomodations in several destinations this way, also asking for detailed pictures by email! If you’re planning your first airplane trip, please be aware that all airlines are required to provide an inflight special wheelchair designed to through the narrow aisles. If you need to use the lavatories, let a crew member know so they can assist you. It is a good idea to call the airline ahead to ask whether their particular models have accessible lavatories as per required by regulations in certain countries. If you’re a power wheelchair user, it’s important to be aware that it might be damaged in the transportation process. However, there are ways to avoid this. You can include handling instructions taped to the packaging of your electric wheelchair with clear instructions such as “NOT LAY ON ITS SIDE”. There are statistics for airlines in America that were recently released indicating that there are several companies that treat this delicate cargo with care and respect. Review the power wheelchair mishandling statistics here. wheelchairs, all designed to help you have the time of your life. Do your research to discover what could be the best fit for your abilities and needs. Also, you can contact us and we can help you find out. Our company, Wheel the World, was founded in order to empower people with disabilities to explore the world without limits. We know we’re not the only ones to offer tourist packages to gorgeous destinations where you’ll get everything you need to have the experience of a lifetime tailored right to your requests: the equipment, the assistance, the expertise. Consider hiring a provider to take you to your dream destination and to guide you diving, trekking, hiking and biking through remote landscapes. We really know our stuff. Consider these tips for your next trip, whether it is the first one or if you’re already a seasoned traveler. We’ve taken hundreds of travelers with disabilities to challenging destinations with amazing results, and the experiences have always been incredibly rewarding. Always be careful to call ahead and gather as much information as you can, and be cautious enough to put yourself in the hands of professionals when necessary. That way, the experience will turn out amazing, just how it is supposed to be.